Identification: Branching skin flaps run continuously from pectoral fins around front of head forming a lattice-like beard. Markings composed of an intricate pattern of light and dark dots and rings over a brown to beige background. Head and body very broad and flattened. Size: Maximum length exceeds 3m. 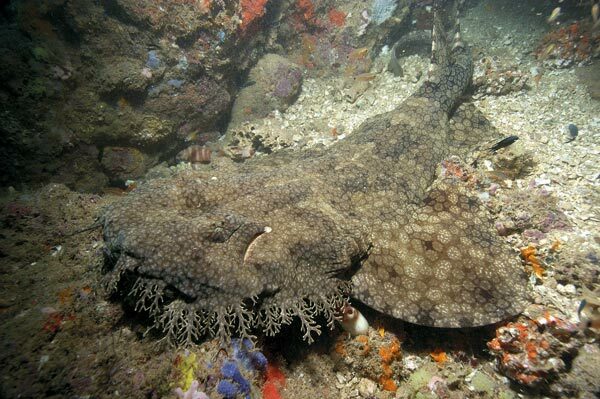 Habitat: Rocky and coral reefs. From 1 to 40m+. Abundance and distribution: Northern W.A. to Queensland and north into Indonesia and Papua New Guinea. Behavior: An ambush predator. Remains motionless blending with reef structure until small fishes swim within striking range. Then, rapidly opens mouth sucking in its prey. Actively hunts at night for Bony fishes. Observations: I witnessed this species lying motionless in exactly the same spot for three consecutive days. Its reasonable that it did not move at all during this time relying on food swimming by. Its also possible that it simply returned to exactly the same position each day but it was also present during night dives. Photographs: Exmouth Navy Pier, W.A. and Blizzard Ridge (reef), Exmouth, W.A. 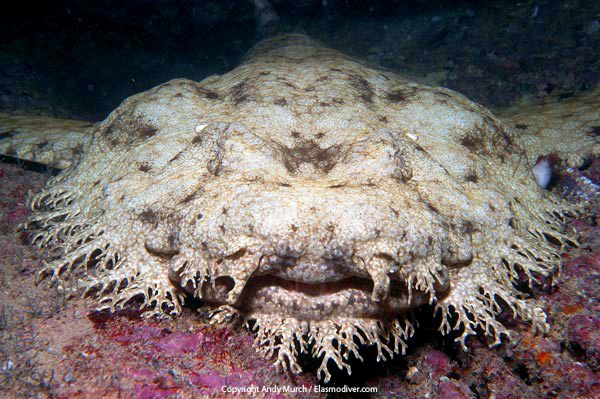 Similar species: There are six described species and a few undescribed species of wobbegongs. Most can be distinguished by barbell configuration and markings. None have the intricate skin flaps dispayed by this species. Diving logistics: In W.A., Exmouth Dive Centre can arrange day and night dives at the Navy Pier and 2 tank boat dives at blizzard ridge. 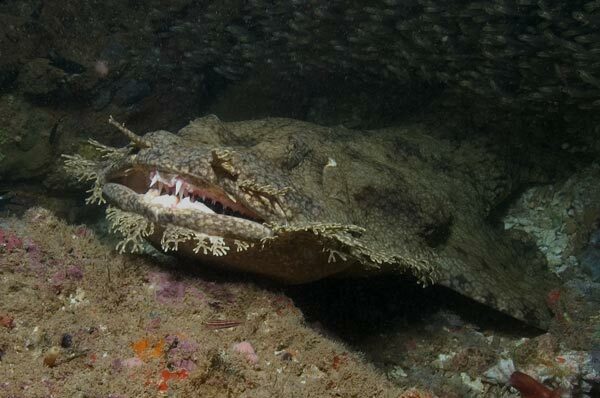 The wobbegongs usually present at these sights. 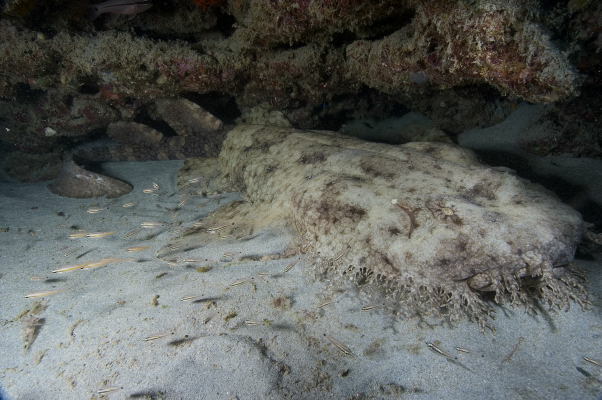 At the pier it may also be possible to see Wards wobbegongs, and Epaulette sharks but these are much more secretive burying themselves in caves during the day. There are probably countless other locations all the way to Queensland where Tasselled wobbies are resident.